“Small wins” and community projects are where Our Katahdin got our start. Community Projects are still one of our top priorities as an organization, creating a platform for individual leaders to enact change in their communities. These small wins create big success and contribute to optimism and engagement with the future of our region. We have two projects up on the website now that are very close to being 100 percent funded. Your donation could help us get there! Remember that your entire donation (with the exception of small fees to Paypal to protect the security of your transaction) goes directly toward completing these specific projects. 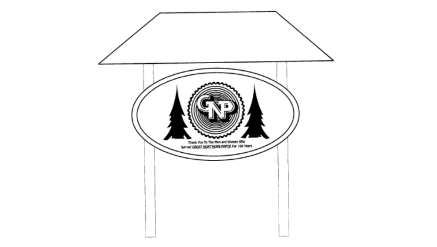 The GNP Tribute sign in downtown Millinocket is only $225 away from its goal. Project leader Jimmy Busque has designed a beautiful new, locally-made tribute to generations of GNP workers and the town’s history to replace the old sign in the pocket park next to the Millinocket municipal building on Penobscot Ave.
Today’s weather may be frightful (and feeling wintery! ), but spring isn’t so far away. We are over 70 percent of the way toward funding “Project Dugout,” led by Keri York. This project will refurbish the dugout benches at the baseball and softball fields behind Stearns. Visit the project page to see more details on the project and help us make sure the new benches are ready for the spring season! As soon as we close out one of these projects, we can launch our thirty-fifth community project, led by middle-school teacher Anna Loome: “Flexible Seating for Middle School Readers.” Your donations will purchase bungee chairs, bean bag chairs, and cushions for 7th and 8th grade English and Language Arts students at Stearns Middle School. These comfortable and cozy seating options will be a privilege for students to use during independent working time, especially while reading. Let’s support our middle-school students by creating a more appealing and engaging environment in which they can improve their reading skills.